The US Dollar was sent crashing to a three week low against the Euro and shed over one percent against a handful of emerging market and high yielding currencies yesterday evening, following a dovish surprise from the Federal Reserve. The FOMC kept interest rates unchanged, while reiterating the pledge from its December meeting to be ‘patient’ when it comes to future hikes. Fed Chair Jerome Powell did, however, state that while the US economy was in a ‘good place’, the case for additional hikes had ‘weakened somewhat’ since its last meeting, suggesting that it may be at the end of its hike cycle. There were also some significant changes to the statement compared to last month. Policymakers removed the phrase that stated risks to the outlook were ‘roughly balanced’. The central bank cited uncertainties that could weigh on near term growth, namely Brexit, the US government shutdown and US-China trade war. The need for a pause in hikes and prolonged assessment of economic conditions has also come off the back of a marked slowdown in inflationary pressures in the US. 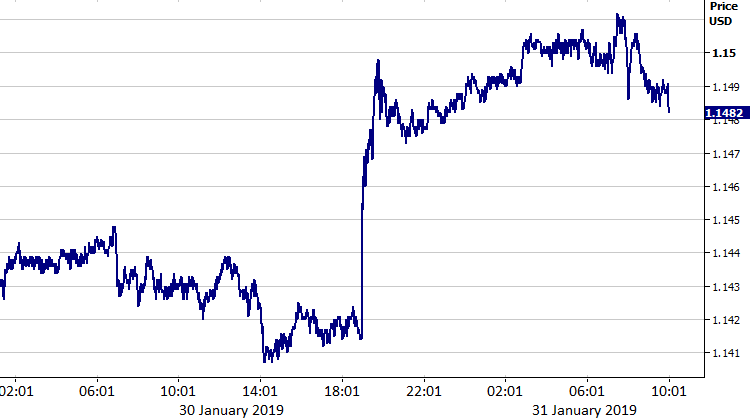 Currency traders were caught off guard by last night’s dovish announcement, which marks a sharp U-turn from as recently as last month, when policymakers indicated via the Fed’s ‘dot plot’ that the central bank was still on course to raise interest rates twice in 2019. We think that the broad consensus among FOMC voting members is that interest rates are now effectively at the ‘neutral’ rate, which ensures both steady inflation and on-trend growth. We expect the Fed to once again revise lower its interest rate projections at its next meeting in March and instead indicate that it expects to keep rates on hold in the US throughout 2019. We are now not pencilling in any more hikes in the US this year, which could significantly limit scope for additional US Dollar appreciation. Gains for Sterling were fairly limited compared to most of its peers following yesterday’s Fed meeting, unsurprising really given the looming uncertainty over Brexit. With less than two months to go before the UK is scheduled to leave the European Union, all hands are on deck in order to try and strike an agreement that could pass a parliament vote. Theresa May is returning to EU leaders to seek an alternative arrangement to the NI ‘backstop’ following the outcome of Tuesday’s vote. Regardless of what she comes back with, her withdrawal bill must go to another vote before 13th February. Given the EU has repeatedly ruled out renegotiation, this vote is again likely to fail. In such a scenario, MPs will again vote on proposed amendments to her text. We think this could pave the way for a number of Tory members to back the motion to extend Article 50, which would be a Sterling positive. That being said, the next couple of weeks are likely to be difficult for the Pound and, if last night’s moves are anything to go by, we think that the currency could underperform most of its peers during that time. Today could be a fairly busy session in the Eurozone, with revised GDP numbers expected to show that the Euro-area economy grew by just 0.2% in Q4 2018. On Wednesday, the latest German inflation data dragged the Euro lower by giving an additional reason for the European Central Bank to hold its policy steady for some time yet. Headline inflation in Europe’s largest economy came in at just 1.4% in January. This was well below the 1.6% that the market had been pricing in and its lowest level in almost a year. As we have reiterated recently, we see almost no chance that the ECB hikes rates in 2019.